The Secret Life of Pets hit the ground running at theaters this weekend, raking in more than a hundred million dollars. 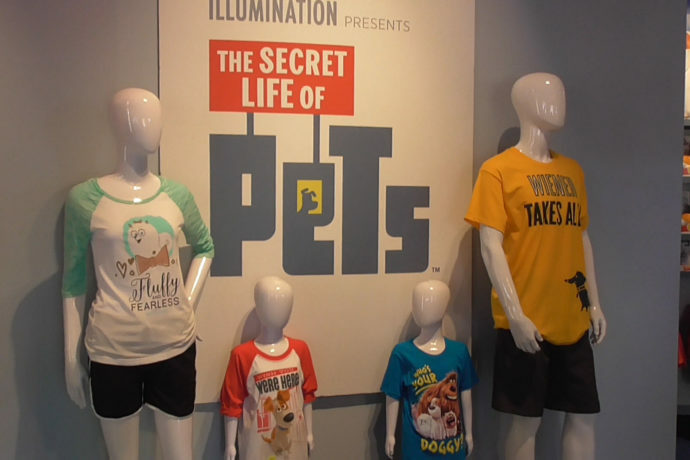 Earlier this week the Pets got their own store in Toon Lagoon at Universal’s Islands of Adventure. The Rocky & Bullwinkle themed ‘Wossamotta U‘ store is now completely filled to the brim with Pets merch. There you can find countless plush toys, shirts, cups, mugs, books and more. There’s been talk of the Pets getting their own ride in Hollywood, and maybe in Orlando, but only if the film performs well. Given the success it’s having at the box office so far, I’d say there’s a pretty good chance we’ll be seeing them come to Orlando. The rumored location for a new Secret Life of Pets ride is the barely used amphitheater in Toon Lagoon. Only used for special events a couple of times a year, this theater could be torn down to make way for a completely new family friendly trackless dark ride. Rumors say the ride could feature set-pieces from the film including Katie’s apartment, cat’s alley, and the flushed pets lair in the sewer, all with animatronic characters. Check out the video and images below to see all the merch and the rumored ride location and stay tuned for more Pets news! Who wouldn’t want a Snowball plush? That’s all for now. See all Secret Life of Pets updates here and subscribe to the feed for more continual updates!. During my visit to Universal Orlando you couldn t help but notice Incredible Hulk at night, as they have added a new lighing package that makes the entire ride glow green after dark, including some interesting new green lights running up and down the launch tunnel.